Thanksgiving is by far my favorite holiday. Our tradition is that my husband and I wake up early and begin the preparations for the feast together. He gathers all the ingredients for the turkey while I prepare all of the fixings. Cutting and chopping side by side in our small kitchen surrounded by the smell of fresh herbs and vegetables is one of our favorite things. Thanksgiving is a day of restful productivity for us. By that I mean that despite cooking all morning and preparing the house for guests, there is such an anticipation to the day that makes the work not feel stressful, but pleasurable. Cooking is in itself so therapeutic and doing it together for our whole family feels so special to us. It’s the one day of the year we both always look forward to. In addition to a full table of food and family, our Thanksgiving tradition includes an opportunity for each person around the table to share something they’re thankful for. This week Jeff and I attended a funeral, which has a way of making me more reflective than usual. It always strikes me as odd that we find out so many great things about a person after they’re gone from this planet. I’ve always felt that we should take more opportunities to celebrate the great things in people while they can still hear and know how we feel about them. 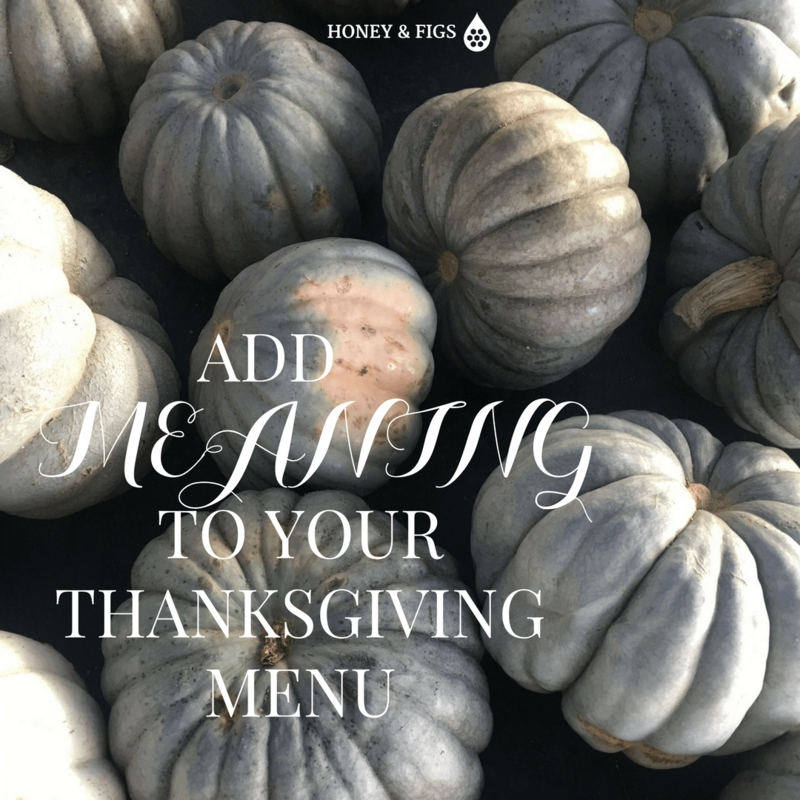 As I was putting together our Thanksgiving menu, I thought “what better time to celebrate the people in your life than at Thanksgiving?” so I decided to intentionally add meaning to my menu by crafting a personal note of affirmation for each guest. As we take the time to be grateful for the year we’ve had and the blessings of food, friends and family, writing down a few lines of positive affirmation for the people around our table is a simple but powerful way to add meaning to your holiday. Science has shown that practicing gratitude has mental, emotional and physical benefits. One of the best ways to overcome difficulty in our lives is to practice gratitude. The Journal of Personality and Social Psychology published a study in 2003 that found recognizing all that you have to be thankful for, even during the worst of times, fosters resilience. Given the climate in our culture today, I could use a little more resilience. 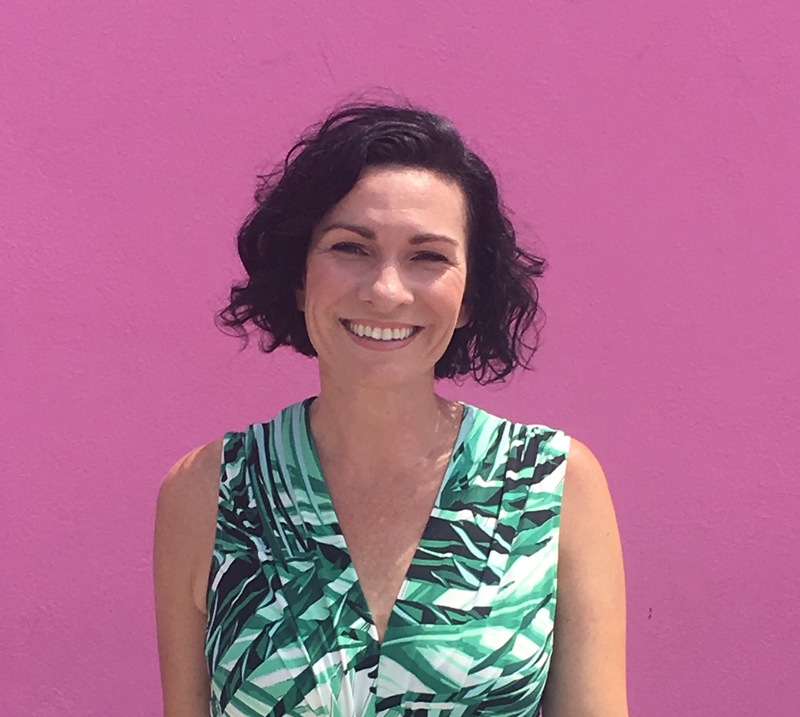 Researchers have specifically found found that two gratitude activities (counting blessings and gratitude letter writing) reduced the risk of depression in at-risk patients by 41 percent over a six month period. Now we have a scientific excuse to purchase pretty note cards and calligraphy pens. Sign me up! 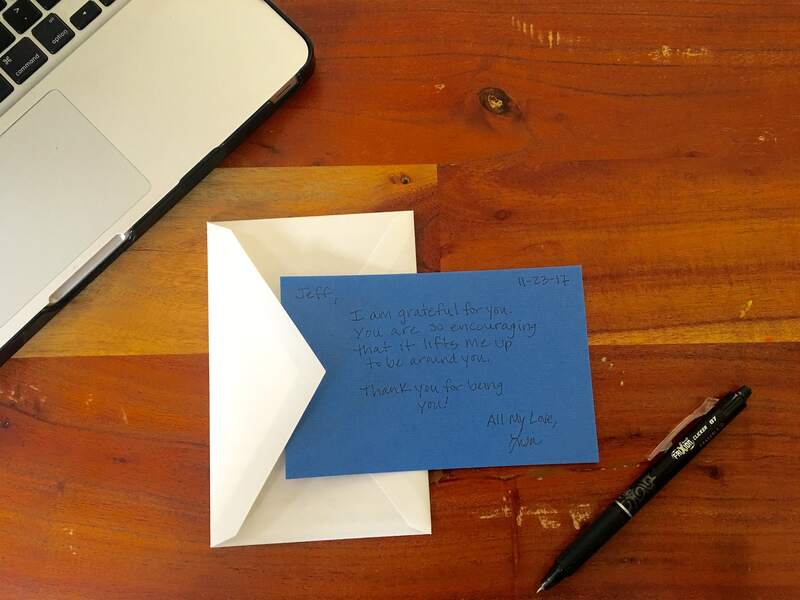 If you don’t quite know where to begin when writing a gratitude note, here is a simple step by step guide to writing a meaningful note. Handwritten is key. No type-written words or emoji’s will do for this exercise. To have the biggest impact, you have to do it the old-fashioned way and write out the words with your own beautiful hands. Start with pretty stationery on sturdy card stock and a good pen. A calligraphy pen or Sharpie can also aid in making a bolder statement on the envelope. 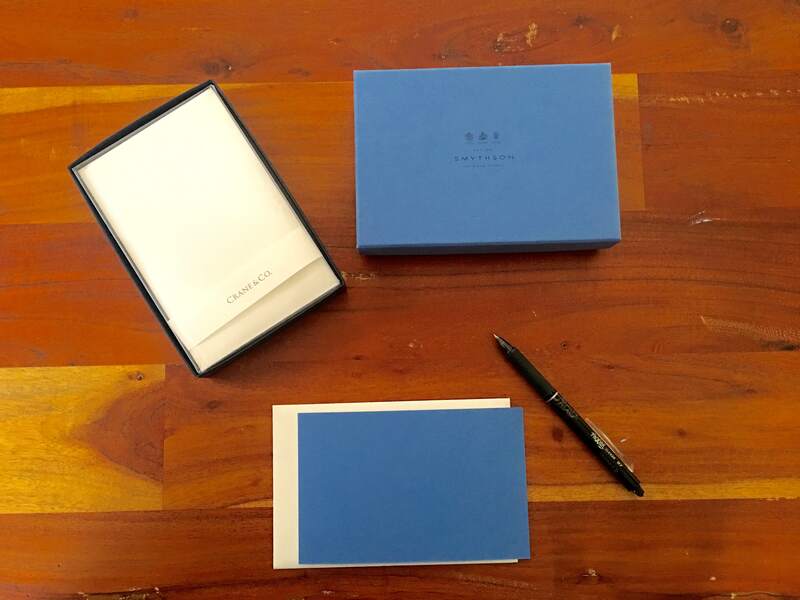 I like these correspondence notes from Crane or you can step up your game and use the same stationery as Jackie Kennedy, Smythson Nile Blue Note Cards. Envelopes are sold separately which can get pricey but I love these blue note cards. I believe that when you’re crafting beautiful words to people, they should be on beautiful paper. When it comes to pens, the standard advice is to always use a fountain pen, but I don’t like pens that feel heavy in my hand. I also get a bit nervous when I write heartfelt words to people and can easily make a mistake. I don’t want to have to waste a lovely card because of a mis-spelling. For that reason, I love using Frixion Retractable Erasable pens. They come in all colors, and make your mistakes disappear like magic. I’d choose black for this exercise. Once you have your lovely tools, set aside the time to write. Blocking a half hour on your calendar this weekend to accomplish this task should be plenty, depending on your number of guests. Figure 2-3 minutes per note. It will likely not take me more than 15 minutes to complete mine as I will only have seven guests but I blocked 30 minutes so as not to feel rushed. The more time you have to think, the more meaningful you can make the card for each person. Try to concentrate your words on what is it in your opinion that makes this person special and tell them so. Focus on expressing your gratitude for who they are, not for what they did. For instance, saying “you are a shining star” is better than “great job on that promotion this year”. “I am grateful for you. As you begin to think of that person, fill in the blank with a sentence or two about a characteristic you appreciate in them. To have the most impact, make sure the statement is true of them. If you try to compliment them in a general way that does not really ring true to who they are, it will not be as impactful. Don’t forget to say the words “thank you”. It can be as simple as “thank you for being you” or thank you for being awesome” or “thank you for making the world a better place”. Just make sure to say it. 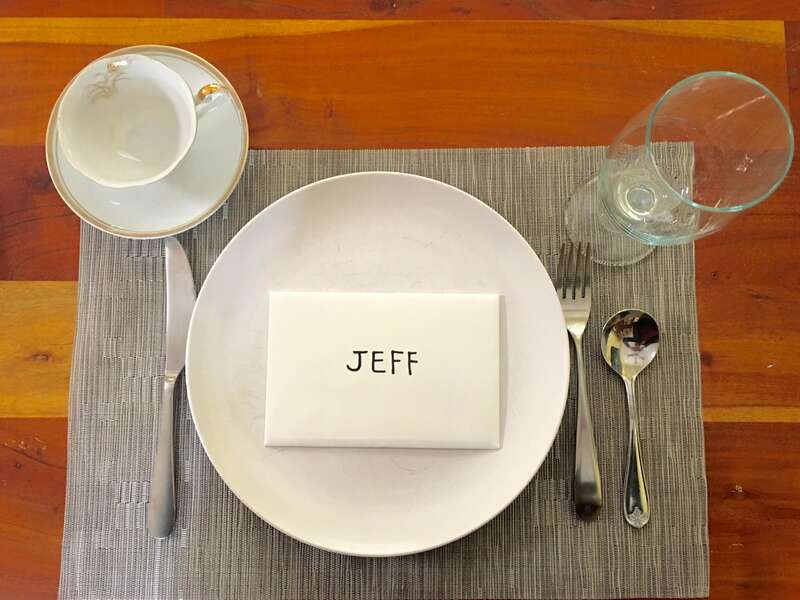 Allow for the gratitude note to act as a place card waiting to greet them at their place setting. 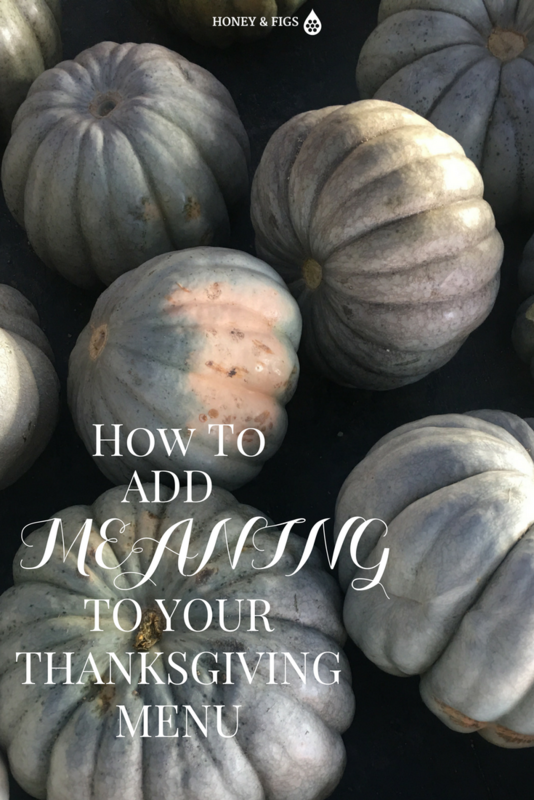 It serves a dual purpose as affirmation for your guests and a practical addition to your thanksgiving table scape. Your guests can choose to open the envelope before or after dinner. Likely they will open it beforehand (curiosity always gets us) and it will set the tone for a lovely meaningful meal. I love this Lisa! Nilanga and I will be hosting Thanksgiving this year and I definitely want to incorporate this! Wonderful idea. Thanks Janice! How awesome that you’ll be hosting Thanksgiving! I’m sure it will be wonderful. All my best to you, Nilanga & your family!